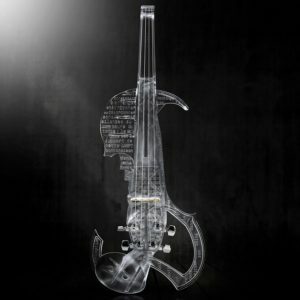 When to change the strings of your violin? As with any instrument, the strings of a violin wear out as time goes by. 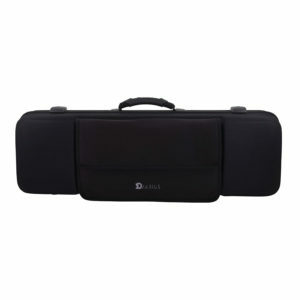 This can be accentuated by a regular practice or an improper storage of the instrument. The strings can then oxidize and break. In this case, changing the strings is mandatory in order to preserve the sound quality of your instrument. 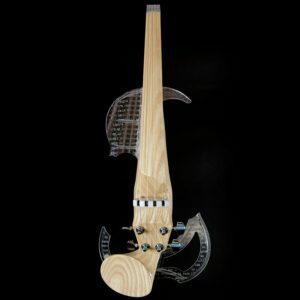 The special feature of the 3Dvarius electric violins is: the use of guitar tuning pegs. All our electric violins use guitar tuning pegs instead of traditional acoustic violin pegs. These tuning pegs were chosen for several reasons. String tuning is simplified and longer lasting. On our electric violins, the violin pegbox has been moved to the bottom of the instrument in order to redistribute the weight of the instrument. It was impossible to use acoustic violin tuning peg for this purpose. 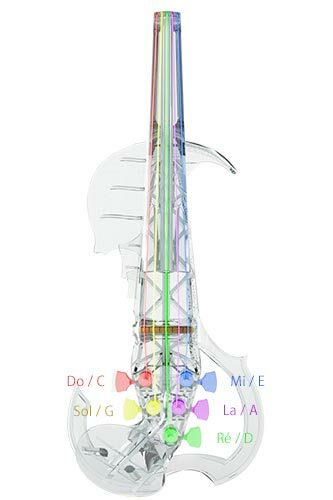 Another special feature of the 3Dvarius electric violins is that they only use ball-end strings. Other types of strings are not compatible. A simple rule to follow each time will be to change one string after another. You must never remove all the strings at once and then consider putting them back. If you remove all the strings, the bridge can move or fall, and you will then experience difficulties when trying to put all the elements back in place. By removing each string one after the other, you will leave a permanent tension on the bridge and avoid moving it. This also helps to preserve the tension, created by the strings, that the body of your violin undergoes. Here are the strings available for a 4- and 5-string model. The first string mentioned will always be the lowest and is located at the left of your bridge. 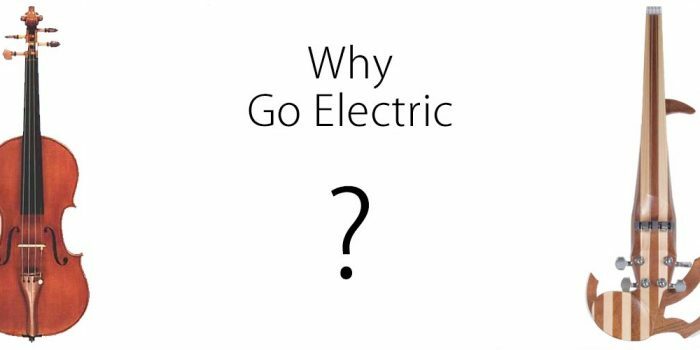 What are the steps to change the strings of an electric violin? Remove the string from the top of the instrument by pulling on the ball-end. If, when pushing, the string does not move, grab it on the upper part of the neck with a non-sharp object such as the tip of a small pair of scissors or tweezers. Then grab the ball-end of the string and pull it out. It is possible that the tension of the string has pressed the ball-end, so pulling it might result difficult. In this case, use the tip of a small pair of scissors to grab it and pull it. 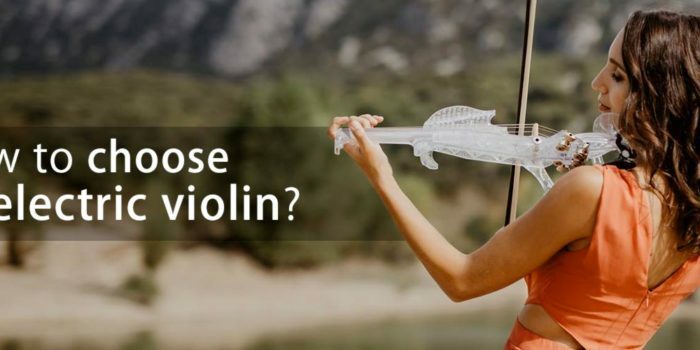 We remind you that the 3Dvarius electric violins are only compatible with ball-end strings. Before buying your strings, check that they have the words “ball-end strings”. Thread the string into the instrument pegbox until the ball-end gets in contact with the back of the violin’s neck. Make sure to place the ball-end in the slot provided for this purpose. Place the free end of the string in the upper slot of the guitar’s tuning pegs, making sure to leave a 3-finger space between the end of the tensioned string and the tuning peg. This allows the tightening of the string over a great length. Push the 3-finger space left towards the handle. To prevent the string from moving and to facilitate the tensioning, create a 90° angle with the remaining string end when it exits the tuning peg. Tighten the string progressively by turning the peg until you reach the desired note. Be careful with the rotation direction of the tuning pegs. When the tensioning is complete, take a graphite bold pencil (of the 2B kind) and lightly lubricate the ridge of the bridge that will fit the string. This facilitates the sliding of the string and eases the replacement of the bridge in case it moves. Before cutting the excess end of the string, check that the string is well placed on the ridge of the bridge. If necessary, replace it without forcing it. Finally, cut the excess end of the rope at the level of the tuning peg attachment using a wire cutter. Repeat this process for each string. To simplify changing the strings we have made an explanatory video detailing each step. New strings tend to move, you will probably need to re-tune your violin the first days. Above all, do not stretch your new strings excessively, that will not solve the problem. On the contrary, you risk damaging them or even breaking them. Once all the strings have been replaced, make sure that the bridge has well kept its upright position. It may slightly tilt forward or back when changing the strings. To ensure excellent sound, the bridge must always be placed vertically to the body of the electric violin. To determine whether the position of the bridge is the correct one, look at its position from above or from the side. If it leans forwards or backwards, it needs to be replaced. 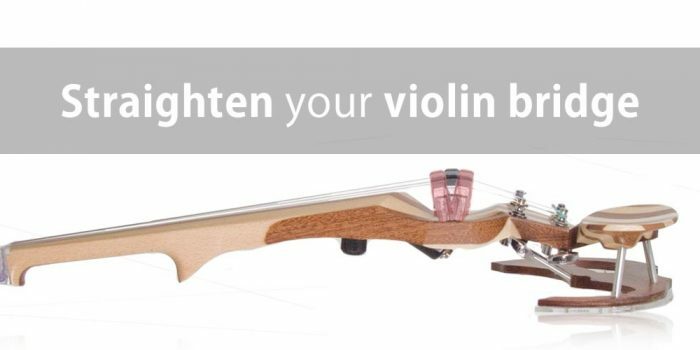 Refer to our tutorial in order to properly straighten the bridge of your violin. 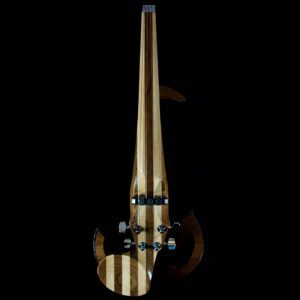 Posted in Blog and taggued electric violin, violin.